This summer we had a great experience at Great Wolf Lodge in Grand Mound, WA, as our first family vacation. We couldn’t have had a better place to spend it. I want to share with you why we love Great Wolf Lodge. They truly went out of their way to make our stay memorable in a time of need. Let me start by telling you about the staff at Great Wolf Lodge. The day we left for our weekend trip was just a day after we lost my Nana (Annie’s Oma). Our family was at a loss of if we should even continue with our trip. However, we decided it was best to get away with the kids during this difficult time. Before our arrival, my mother had snuck in and paid off our room. She shared our circumstances with them as she left us a gift card to help with expenses. After that, Great Wolf Lodge went above and beyond. We were welcomed by the biggest of smiles. Another reason why we love Great Wolf Lodge. You don’t always see that anymore. They even helped keep the secret of the room payoff and surprise gift card my mother had left. They offered the kids’ wolf ears (which our daughter just loved) and sent us on our way with helpful information about the resort. When we reached our room, we realized that had placed us in a “Wolf Den suite”. We also were greeted with a plate of goodies and Paw Passes ($79.99 per package *prices subject to change) for both of the kids. A “Wolf Wakeup Breakfast pass” was also included. I do not know if this was something they had already planned for us for our review or out of kindness as we were enduring our loss, but I can’t thank Great Wolf Lodge enough. They were there for us in a time of need and that is just one of the many reasons why we love Great Wolf Lodge. Either way, it brightened our day during a very hard time. The Paw Pass was amazing. I recommend checking out the packages provided by Great Wolf Lodge because they do save money and make things more fun. The kids loved checking off the different goodies they could receive and do. Our daughter loved getting a new pair of goggles and our son still sleeps with his “Creation Station” animal. Each package offers different activities and discounts. You’ll be sure to find the right one that suits your family for your vacation. 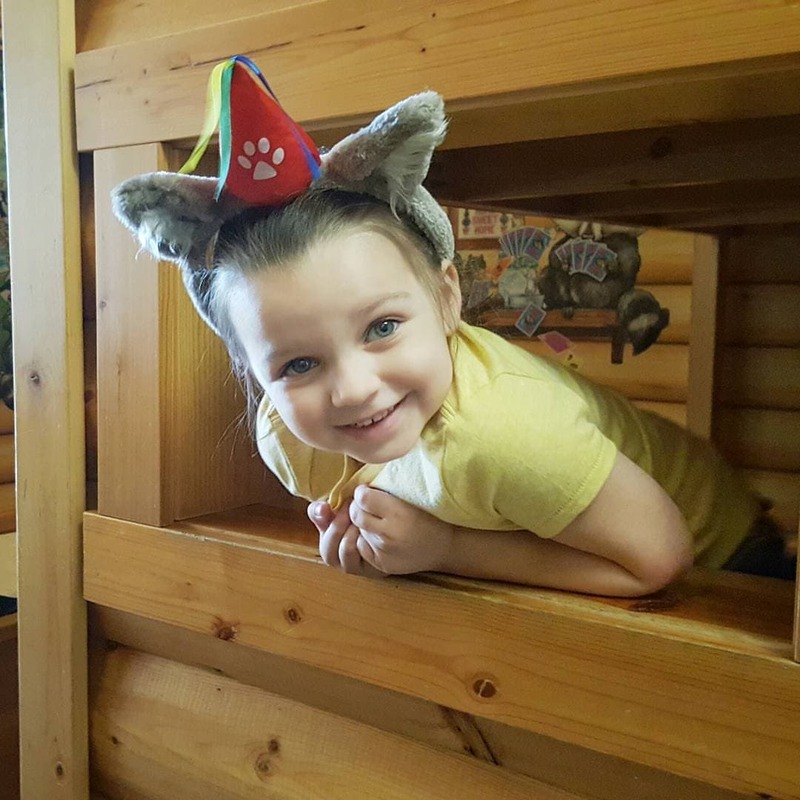 There are even some great ways to celebrate a birthday at Great Wolf Lodge. If you’re thinking about a fun getaway to celebrate, Great Wolf Lodge is a great option. We loved that there were attractions and activities outside of just the water park. Far more than we expected. Plus, they also had them for all ages. The website also offers an “explore by age” option so you can easily plan your time during your stay based on your family ages. I could easily write a separate post for each activity and attraction, that’s just how much is offered at Great Wolf Lodge. Our kids’ favorites were the scavenger hunt at the “Creation Station”, and our daughter loved her time at Scooops® Kid Spa. We also enjoyed the “Story Time” and “Great Wolf Kids Activities” in the lobby area through the day. You can really tell the people who work in each of their positions love their jobs. They love working with kids and families to make their stay extra special. As I said before, I could write many posts about each experience at Great Wolf Lodge. The room was amazing and out of the ordinary. I loved that the kids had their own “Wolf Den” to play and sleep in. We had plenty of room for our family to enjoy our evening there. The food in the buffet, counter services, and Lodge Wood Fired Grill® was impeccable. The variety of fun foods for every taste is available. Our kids can be picky eaters while on vacation and it is important to me to ensure that they eat things they enjoy. I want my kids to have the same experience I do. We truly had a great time and were pleasantly surprised by how much we enjoyed ourselves. Next time, we will be staying much longer. Great Wolf Lodge went above and beyond our expectations in the kindness of their staff (who always asked how we were enjoying our stay when we passed by) and in the fun available to us. If you have a Great Wolf Lodge near you and are considering a vacation close to home, I recommend looking into it. Great Wolf Lodge truly is more than just a lodge and water park. You will make memories, have fun and enjoy every moment together as a family here. A HUGE thank you to Great Wolf Lodge for all of your hospitality and fun for our family in a time of need. This is why we love Great Wolf Lodge. They truly go above and beyond and have that guest service that we love about other top places we choose for family vacations.